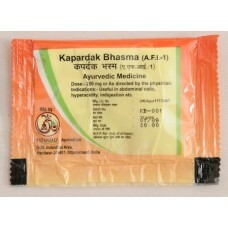 Kapardak Bhasma gives relief from chronic indigestion problems, acidity, flatulence, colic pains, etc. Unbalanced diet and sedentary lifestyle constantly harm and weaken our digestive systems. Kapardak Bhasma is a time-tested formulation that soothes the stomach, heals the damages from contaminations, treats ulcers and boosts digestion. It is made from herbal extracts with natural detoxifying and antibacterial properties. Take Kapardak Bhasma regularly to give you lasting relief from lingering digestive ailments. Experience the soothing relief of Ayurvedic medication with Kapardak Bhasma.